Il Best Western Diamond Inn è situato nel centro di Three Hills. L'hotel è vicino alle principali attrazioni turistiche. Approfittate tutto l'anno del miglior prezzo garantito e di offerte esclusive. Situato vicino alle maggiori aziende di Three Hills, alle attrazioni della città e a meno di un'ora in auto da Drumheller, Red Deer, Hanna, Olds e Settler, il Best Western Diamond Inn è l'hotel di punta di Three Hills e offre un servizio clienti eccezionale e sistemazioni confortevoli, che lo rendono perfetto per turisti e viaggiatori d'affari. Ciascuna camera spaziosa e arredata con gusto del Best Western Diamond Inn mette a disposizioni degli ospiti accesso a Internet ad alta velocità gratuito, chiamate urbane gratuite, ferro e asse da stiro, macchina per il caffè da una tazza e asciugacapelli. Sono inoltre disponibili letti king size e altri servizi aggiuntivi. Subito fuori da questo hotel di Three Hills, Alberta, gli ospiti troveranno facile accesso a Prairie Bible College, Street Freaks Annual Car Show e a numerosi negozi e ristoranti. I viaggiatori d'affari apprezzeranno la vicinanza del nostro hotel ad aziende e cantieri locali. Gli appassionati di sport che soggiornano in questo hotel di Three Hills, Alberta, avranno l'opportunità di assistere alle emozionanti partite di squadre come Sabres, Pilots, Thrashers e Royals. 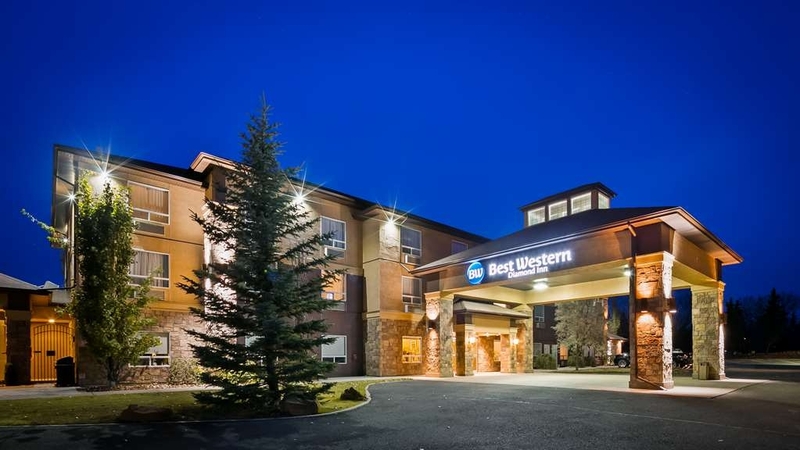 Rendi indimenticabile il tuo soggiono a Three Hills, Alberta: prenota oggi stesso al Best Western Diamond Inn. We arrived at the hotel in -45 degree weather to check into a room with no heater. We had a sick child. The staff member checked the furnace and learned that it may not have worked due to the debrie and dust build up. After finally being moved to a new room, there was issue after issue including a high bill and incorrect charges that were never rectified. The extreme smell of potent chemical in both rooms (opposite end of the hall) would have seriously harmed someone with a sensitivity to smells or a child with asthma. The staff tried really hard to mask the odour with copious amounts of fabreeze. Our internet would not work. We stayed at that hotel to enjoy the amenities INCLUDING a hot tub as advertised. We agreed to pay the inflated rate to enjoy the hot tub. Our son was competing in a hockey tournament and we thought it would be a real treat for him to enjoy a hot tub after playing a contact sport. Every single website Indicated there was a hot tub but we later learned, after our swim suits were on that the hot tub had shut down over a year ago. We should have book the other hotel with a pool although we were misled by the false advertising. The other hotels were all full. We booked over a month in advance. The rate we paid far too high, too high for the Hilton in Calgary and this was three hills. AND they arbitrarily charged us triple the amount for a cot and never reimbursed the sum they stole. Hello, as we mentioned in our previous email communications, we appreciate you letting us know your concerns during your stay. We were able to inform maintenance and the issues have been resolved. We do not advertise anywhere that we have a hot tub at our property, however, we do offer our guests free admission to the Three Hills Aquatic Centre. I apologize if you are still confused about the charges for your 2 night stay - there were no extra or incorrect charges and unfortunately, we were unable to fulfill your demands for a full refund. 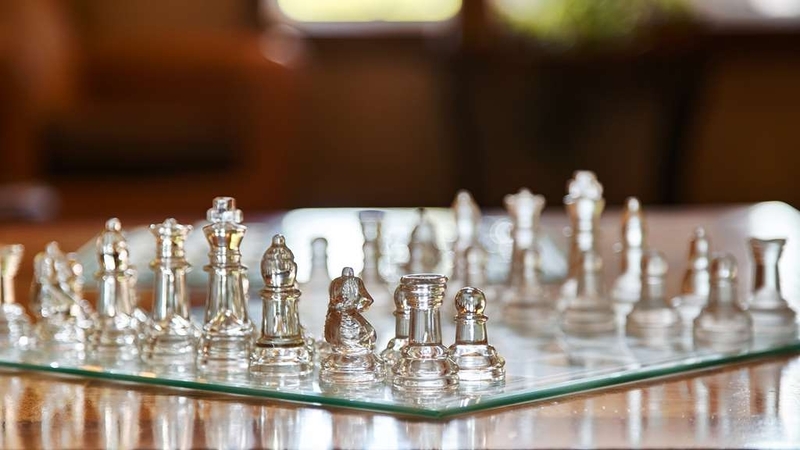 We take the concerns of our guests very seriously, and work to resolve in the best way possible. Thank you for taking the time to leave us a review. Top notch hotel with fabulous breakfast each day. Service was immediately done for us. Our tournament had 40 rooms and the staff was absolutely perfect. Thanks. Amazing place to stay. Great beds and pillow. Super clean and warm. I have nothing negative to say about our time here. The complementary breakfast is simply outstanding! The fresh fruit was especially appreciated. Also of note was the friendly and helpful staff. We thoroughly enjoyed every moment of our time here. "Quick night stay due to bad weather"
Room was clean and it looked like they shampood the carpet just before my stay. Not recently renovated but well kept. In my opiniom they need to renew their mattress & pillows as you would expect luxury & extreme comfort from most hotels stay nowadays Breakfast was included but limited options and no decaf coffee! "Adequate, and a little high priced"
"Great weekend stay in rural Alberta"
The hotel was very clean and staff was friendly. The room was clean, the morning breakfast was good, and there was plenty of juice and coffee. Even though the hotel was 100% full for the weekend, the staff kept up with the demand of all the guests. I have stayed at several hotels around the world and this hotel met my expectations for the price we paid and it's location in Canada. I would stay here again with my family. "Clean Friendly and great staff"
The staff are very pleasant and ready to help when asked. It was a quiet weekend at the hotel as many of the oilfield workers regularly staying there were gone for the weekend. Overall a good experience. This hotel was amazing. I was on a business trip to Three Hills and I didn't expect much at all. This hotel made my trip so delightful. The staff were so accomodating and the rooms were so comfortable! I could tell they had a very high standard. Above all, the free breakfast was truly the cherry on top! Delicious and filling for my day to go smoothly. Just Wow-ed at this gem of a property. I will be back for sure. "A great final 3 nights in our 9 week trip"
OK, really comfortable beds, great shower, more than adequate breakfast all brought together by efficient, helpful and friendly staff. Having stayed in a mix of cruise cabin, rv, b and b, motel and hotel rooms/suites this place ranks amongst the best!! 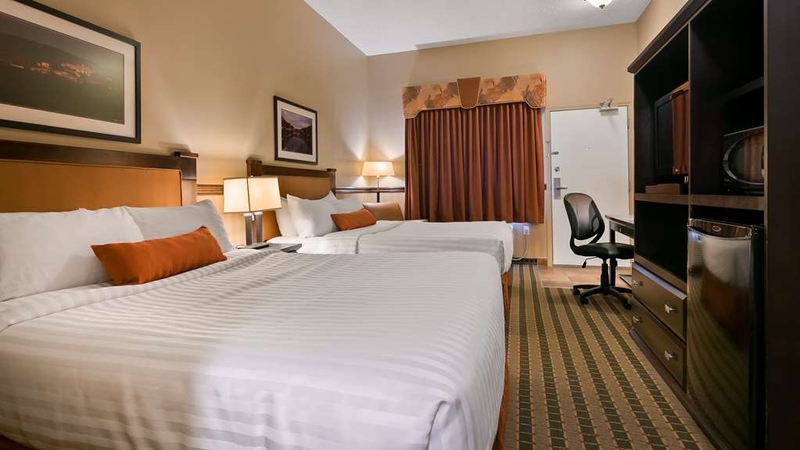 I always know that I can count on getting consistently clean, modern rooms with some of the most comfortable beds when I get a room at a best western hotel. This is the first time that I have stayed in Three Hills at this Best Western, But when I was looking at what hotels were available I didn't need to think about it very long. It is very easy to find, just off the main drag going through town. Lots of parking available and some of the friendliest staff on the planet. I don't think it's a brand new building, but it is very clean, and looks as modern as any others in the area. A very good restaurant right beside it “ the Bell 720”. Great room, very clean, and like O was hoping for.... an awesome bed that I always get an awesome sleep on. I slept like a baby, not a lot of road noise because it's just off the busy main drag. Just an awesome place to get a great rest. I will be coming back here again. "Great value in a small town"
We've come to Three Hills the past few years to golf with friends. This is our first stay here and I was very impressed. Not the most expensive place in town but far nicer accommodations than the other more expensive major hotel in town. Room was typical but very clean. TV package was superior, lots of parking, breakfast was simple but satisfying. The nicer restaurants in town are within walking distance. Didn't check out the pool area. The hotel is outdated, pure and simple. It needs to be renovated. There was a pervasive odour of natural gas as you walked in the front entrance, which we reported. The rooms were small and it was supposed to be an accessible room, but was anything but. The continental breakfasts in the morning were subpar. One staff member to restock and only a microwave at her disposal. I watched her take frozen french toast out of the freezer, microwave it and then put it in the warming tray. No wonder it was so rubbery! Dear Heather H, Thank you for review, I would like to apologize for not exceeding your expectations. Your satisfaction is important to us and we will be using your feedback to make improvements for our valued guests. I hope that you will consider staying with us again so that we can have another chance to provide you with a superior experience. "BW Diamond Inn, Three Hills. AB"
This is a nice quiet, clean non-smoking Hotel. Staff is very friendly and helpful they even reserved us a room we had said we liked on a previous visit. Lots of variety for the breakfast, different hot items each day. I was here on business for a conference. This is simply a great place to stay. Comfortable rooms, very comfortable beds, friendly and helpful staff, excellent satellite TV package, good breakfast - and all for a very reasonable price. The hotel was booked solid, but there was still plenty of room to park, the room was clean, the staff was very cheerful and friendly and the breakfast was very good. We did not use the fitness area, but it looked well equipped. The hot tub/pool area was closed for maintenance, so can't comment on that. We've stayed here before and the overall experience then was also excellent. If we need a place to stay in Three Hills again, this will definitely be our first choice! We typically go to Rosebud the last week in April and stay in Three Hills to break up the return trip to Edmonton. All in all a pretty good experience. The staff were quite efficient and the breakfast was about average for a basically fee included breakfast. The pillows I found to be too firm to even consider using so would advise bringing your own if you like a softer one. The hot tub was not functioning and I have found this to be a commonality at Best Western hotels in Alberta and I sometimes wonder if they ever are functioning or if they put an out of order sign on them in perpetuity. "For the Preview day at the college"
We stayed in a room with two queen size beds. The room was clean and quiet. I used the fitness room at night and it had five or six machines, a water cooler and a shelf with towels. There was a hot tub room but I didn't go in. The hotel was quiet. They provide bathrobes to their elite customers only. When I asked about it, they offered me one and I used it. I would bring my own slippers next time since I don't like walking around in the hotel room bare feet. Breakfast opens from 5 am till 10 am. We went for breakfast at 8 am. We were the only ones in the dining room and the food seemed never touched. French toast tasted very dry but the rest of the food was alright. Overall it was good for us for it was very close to the college, the room was clean and the staff were quite friendly. We got 10% discount on our meal at Black Bull Steakhouse by showing our room key. Friendly and helpful staff. I had noticed that the room used plastic cups, and I commented that I often bring a small glass on my trips but had forgotten to bring a glass on this trip. I prefer my wine in glass. The staff immediately provided a glass that would suit my needs. I was rather impressed. "Great stop for hockey team"
Hockey team went to Three Hills for a hockey tournament and booked this hotel. Very nice BW and handled the team very well. Rooms nice and heating worked on a very cold weekend. Nice breakfast area although food a little blah. Staff accommodated a big team dinner, without complaint. Cheery, large lobby. Would stay here again. Very accommodating.... And clean! Free breakfast was really nice. Deborah was really good to all of us. She works hard. Great front desk staff. For sure will always choose to stay here if back again. ???? Stayed for one night. Hotel was ok, we got some conference room for working. Next building to hotle is restaurant- also was ok. Staff was friendly, room was clean, breakfest was ok. This is very ok hotel for such small town far away from main roads and big cities. Hotel is very clean but I think the rooms need to update their decor and bedding. The bathrooms were clean amazing bathtub, beds comfy but pillows not the best. Hotel staff were very friendly to us. Continental breakfast was disappointing the coffee was so weak, the bread was stale. The heater in our room kept going off every 30 seconds even though we had it on the lowest setting, our room was so hot. Nice place, handy for pet owners with exterior door from your room. Staff was nice, the coffee was awful! Head to super 8 if you want to enjoy a hot tub because they close it during the fall/winter season. "Perfection in small Prairie town!" In such a small town, who would expect such new, beautiful BW with highest standards of excellence in all departments? From the moment I called to inquire about availability, to beyond moment of check out, everyone & everything was fantastic! It's here! Enjoy it for yourself by experiencing! I know I'll be back. ?? "Great Place to stay if you want comfort and complimentary breakfast"
I stay at this hotel whenever I am in the Three Hills area. The staff are wonderful and place is really comfortable and clean. Breakfast in the morning is so good. 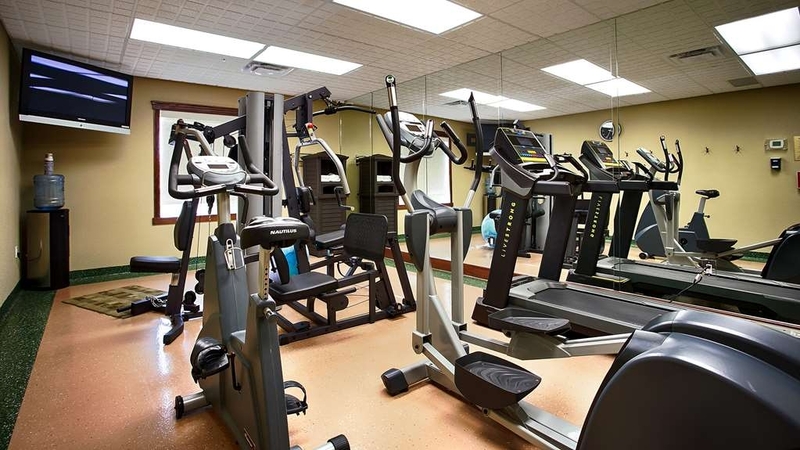 Coffee is always on The fitness room has really good equipment and is cleaned regularly. Will make this the place I stay when in Three Hills. We stayed here 2 nights while in town for a wedding. 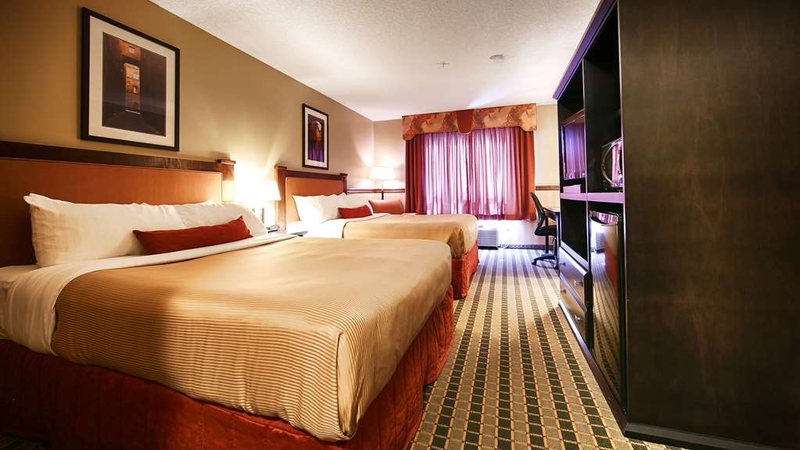 Very clean rooms, comfortable beds, quiet, (even though hotel seemed full), & reasonably priced. The staff were welcoming, efficient and knowledgeable, and they serve a very nice breakfast. Parking is free, restaurant next door, Hospital and service stations mere minutes away. We'll be back next summer! A good solid hotel. Service was excellent and friendly, the room was clean and well maintained, and quite spacious. Breakfast was average, about as expected for a free breakfast. Overall, i would come back to this hotel next time I'm doing business in the area. "Much nicer place than you would expect from such a small town." "Best stay at the Best Western Hotel in Three Hills"
Very happy with service and staff. Over all clean, comfortable, and very pleasant. Would stay here again. Also loved hot tub, and also enjoyed restaurant across parking lot. Great. Would suggest this hotel in future to other's going there or to anyone. I would love to stay again. "BW in Three Hills AB"
Go there once a year and everything from making and confirming a reservation, check in and check out, room service is all first class. Great hotel, beds are superb, very clean, friendly staff. Good breakfast. Good value and restaurants close by. The Bell 720 is a quality retsaurant. "Clean,Friendly as well as Comfy." Very good place to stay, complimentary breakfast and near by restaurants excellent with gluten free options. Rooms are very comfortable and clean with Wifi. The hotel staff were very helpful and accommodating. We will be staying here again. "Three Hill Best Western, A diamond in rural Alberta"
My check in was good. Did not get to the hotel until 2:00am and my reservation was still valid. 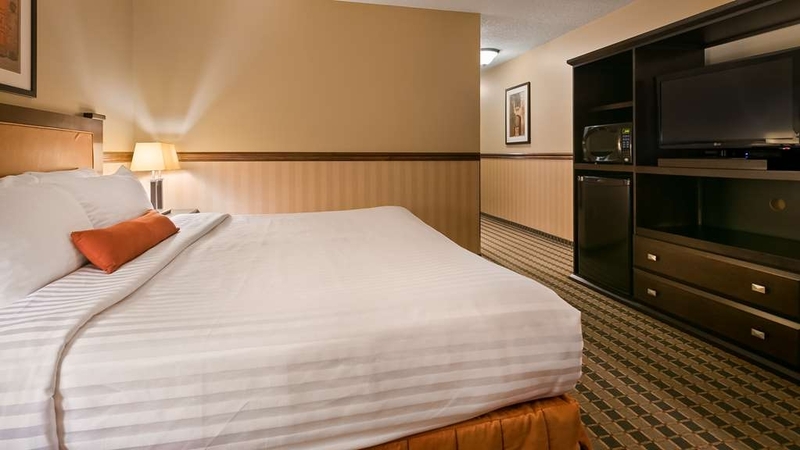 Comfortable, clean rooms with modern amenities. Internet rocked. So many time I've gotten poor / marginal internet, but here it was great. I was on the top floor at the very end on the hall and the signal was full strength. Breakfast was good with basic selection. "One of the nicest Best Western"
This hotel is well maintened and the personnal is very friendly and professionnal. There is many restaurants close enough to go by feet If we go hack to Three hills, will return to this hotel for sure. "Reasonable distance to Drumheller and clean room"
I always stay at Three Hills BW on the way to Drumheller. It cannot compare any high end hotel branches, but it is reasonable quality for the price. Nice and low price restaurants around. You may go to Dry Island Buffalo Jump. One of our best lodging experiences ever! Nothing but praise to give to this place; from the moment upon arrival (the look of the Hotel and its environment/lobby) to the customer care - above and beyond. We were lucky to find this gem, when all other lodgings seemed to be booked. We got the last room at the Inn, so to speak, and it was perfect! 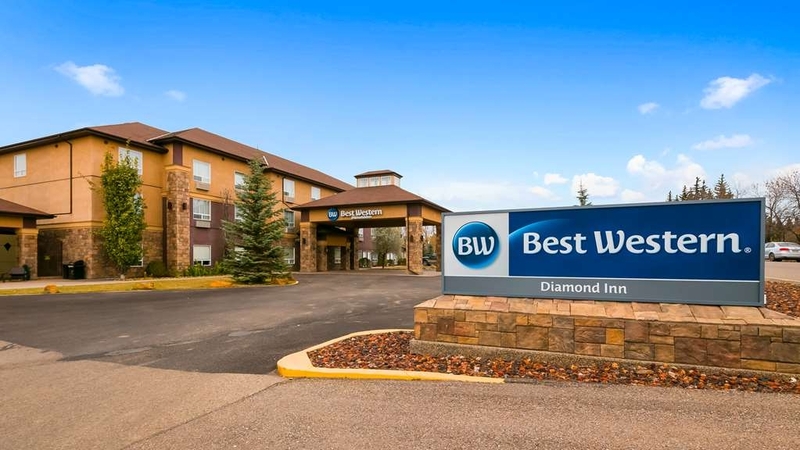 "Stay at BW Diamond INN, Three Hills AB"
We always enjoy staying at the BW Diamond Inn, even though our visit takes us to Drumheller AB. The price is good, breakfast is great with lots of variety and the hotel is clean and staff is friendly. A wonderful hotel to stay at if you are visiting or working in the area. Have stayed here a few times in the past few years, never disappointed. Have visited here with family and as a couple, always very accommodating. Interesting town and a nice central location. Easy drive to Drumheller, Calgary, Red Deer and yet small town price with city luxury. This hotel has a staff that is the absolute BEST for making guests feel welcome and comfortable. It is a hotel that stands out from alllll the rest and I am 80 years old and stayed in many many hotels! "Great place to stay in Three Hills!" "Great "home base" for exploring the area!" Decided to stay here because it is close to Drumheller (about 40 minutes) and much more affordable than staying right in Drumheller. So glad we did! The staff are very friendly, the beds super comfortable, and the rooms are extremely clean. Really glad to have a microwave and fridge in the room. Found breakfast to be great: eggs, sausage, waffles, yogurt, cereal, toast, etc. The staff running the breakfast room kept everything filled up and fresh. The hotel is in a quiet location and we heard no noises from other guests or from outside. Would definitely stay here again! Was extremely impressed with this hotel. It was clean and comfortable with a satisfactory breakfast. It was nice and quiet as well. Had a small mishap with the keys, but it was quickly remedied. Will stay here again! This hotel was very nice. Staff very friendly, helpful and willing to explain where places are. Rooms are nice and clean. If there is a problem willing to listen and correct anything. Breakfast has a good selection and good food. I was travelling with friends, attending events in Red Deer and Drumheller. 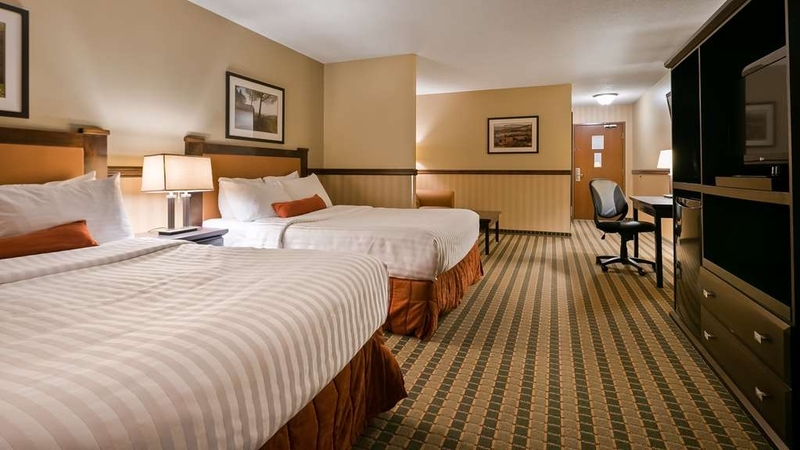 Three Hills was a perfect spot for one of the nights on the vacation, and when I searched for a hotel to book, I found Best Western to have affordable room rates. I rarely use Best Western since it's rather expensive when I travel alone, so it was a lovely surprise that I was able to stay at this hotel this time. It was absolutely perfect for the purposes of our trip, and I'd recommend it unreservedly. Very clean and modern. Bed was comfortable, we stayed in a suite and it had lots of room. Breakfast was okay (had run out of a few items when we showed up). There can be some noise from the room above so if that is an issue request the top floor. Would stay again. Staff was friendly and helpful. Hotel was clean and well maintained. Breakfast was good. Hotel was easy to find. Restaurant next door was had great food and was open until 11 pm. We were on a trip through Drumhellar and found this location to offer the best value in the area. "A nice and relaxing stay, not too far from the Badlands." The staff was very helpful and pleasant,knowledgable about local attractions. Our room was clean, comfortable and quiet. It's only 45 minutes to Drumheller. I'd stay here again whenever I return to this part of Alberta. There is is also an outdoor hot tub but I didn't get the chance to try it. When on a trip you want your time to be free of issues. Staying here does just that. The staff is trained on great customer service. The programs are in place to be efficient so that you can relax. 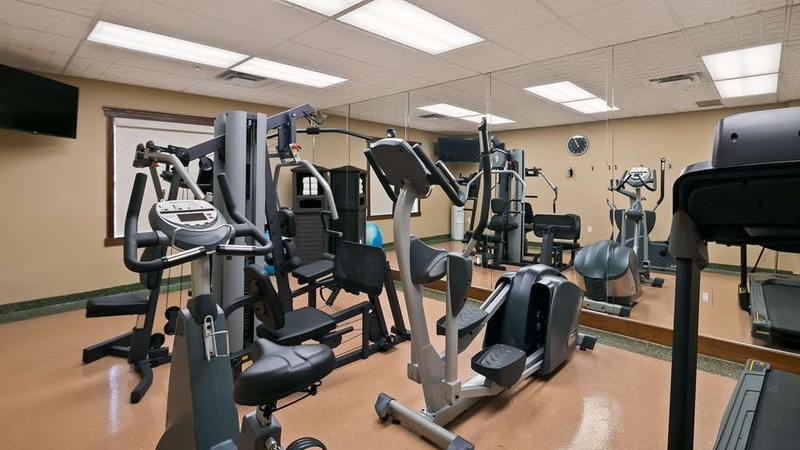 The gym and breakfast is a great way to enjoy your stay. My friend from USA and myself had a wonderful stay on the night July 8th. I had booked ahead for July 8th having tickets for the Passion Play in Drumheller. We were running late and explained to the lady at the reception and she very quickly checked us in and gave us directions to the Passion Play amphitheatre. We just made it there and really appreciated the help. The room was very comfortable and the breakfast spread was very good. No hesitation in recommending the hotel for its comfortable room and service. Stayed here with the family after a day in drumheller. Good rates, room was clean and comfortable. Beds and pillows were great. Staff were very friendly. Only draw back was the eating area for the breakfast on the main floor was too small and crowded. Ended up going out for breakfast because we could not get a spot for our family of 4. Would stay here again. This hotel was perfectly clean and new and affordable. Hot tub was nice touch and discount at nearby restaurant was helpful. Staff were kind and accomodating. Perfect place to stay with family. Would stay again. We had moved from a rural acreage in this area to the northern part of the province and have had three times this spring when we needed a place to stay while we dealt with moving more of our stuff that had been left behind. The staff was very friendly. The breakfast room is well provided. When I needed to do laundry they provided a ziplock bag of laundry detergent. They are pet friendly, too. On our most recent trip we had two wonderful dinners at the Bell 370 Restaurant next door, opting for the special of the evening. We were not disappointed with either night and you get 10% discount with your room key. Plenty of parking. I was able to park my SUV with trailer attached in the back. Windows can be opened. Doors have slow-closing mechanism. (No slamming doors early in the morning) Had a perfect restful stay. Thank you BW. Very nice hotel with a good rate. Not pretentious but clean and a quiet night's sleep in a good king sized bed. Free breakfast with excellent coffee and a good selection of food. The staff were particularly nice and welcoming and the restaurant next door gave us 10% off. 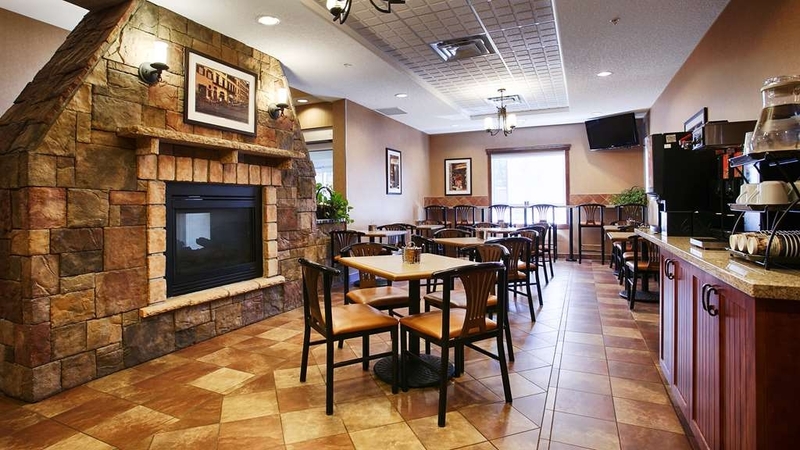 Good value for money and great place to stay and break the long drive into Saskatoon. "Visit to Drumheller, stay at Three Hills"
Worth the drive through the badlands, only 45 minutes away from Drumheller. Great value, very, very clean, helpful, pleasant staff. Was worried we would be too tired to drive to Three Hills but the drive was peaceful and beautiful. Perfect end to a fantastic day! The room was clean and comfortable. The staff were very pleasant and professional. The breakfast had quite a few options, I've never seen a hotel have that many before. We brought children and the staff were also patient and kind to them. Would stay here again. Thank you so much for your kind words! We are doing our best to provide a great breakfast for our wonderful guests! Hope to see you and your family soon! Thank you for staying with us, we are always happy to meet guests from the city! We are so glad you had a pleasant stay, please visit us again soon! Wow, thank you for the awesome review! Thank you so much for staying with us, we love meeting our regular guests! I am so glad you enjoyed our breakfast! We are always trying to figure out new ways to please our guests. Hope to see you again! 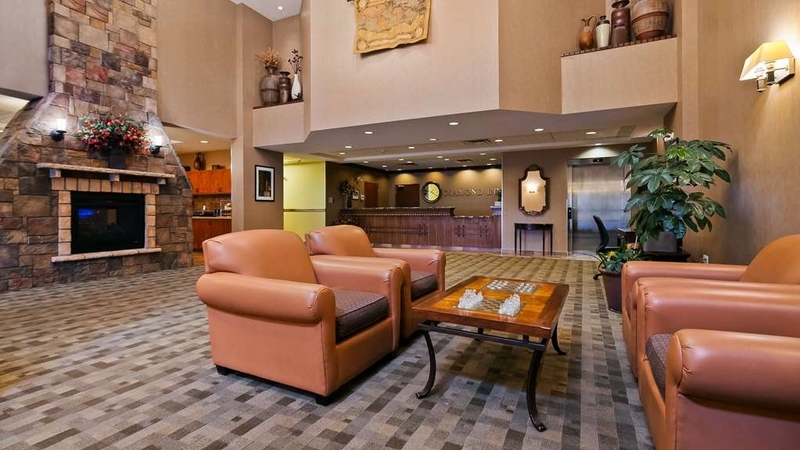 "Best Western Three Hills AB"
Thank you for your review! I am so sorry that the hot tub was not available during your stay. We had it under repair for a while, but it is up and running now! I also apologize for your breakfast experience. Please let our breakfast attendant know next time and she will happily make you fresh breakfast! Please visit us again soon, we will make sure your stay is really really good! Stayed there one night.i have stayed at this hotel. Very clean and good location. Ate at bell 7 twenty next door and it was good food and friendly staff. I would choose this hotel for my next stay in three hills. Thank you so much for your kind words! Yes! Please visit us again soon! 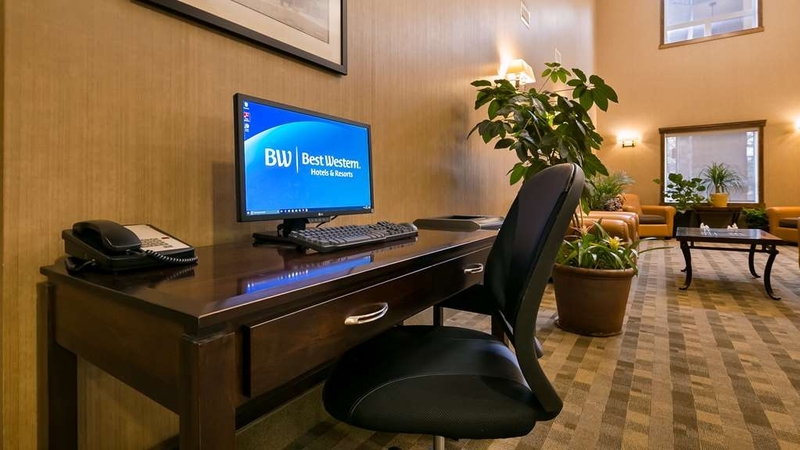 Clean reception area and room, friendly desk personnel, friendly cleaning staff, amazing hot breakfast breakfast included, no problems with tub or faucets (which is sometimes the case, just from so much use), central to everything. Would stay again. Thank you so much for the wonderful compliments! I will share your review with our staff! Please visit us again soon! Three hills is a small town so I was not sure what to expect. This was a great place to stay. Comfortable rooms, and friendly helpful staff. Perfect. As a bonus, breakfast is included. I will stay here every time I am back here. Thank you for staying at our hotel! We hope to see you again soon! This hotel is extremely clean, and the staff are fantastic. The rooms are well appointed, large, and the beds are very comfortable, even the pull out couch. The one and only issue is the toilet. You might as well be sitting on the floor. Never been in a hotel with a toilet as low to the ground. If you don't have knee problems, then it wouldn't be a problem. This would not stop me from recommending this hotel. I have no other issues. Thank you for your feedback! We are glad that you and your family had a great stay! Please visit us again soon! had to go up north unexpectly to pick up parts and needed a place to stay on the return trip, before going back to fix a problem, so I had stayed at Diamond inn before, so called ahead if they had a room, and told him I would there around 10PM, so Peter told me he would hold a room, which he had ready on arrival, without having had to give my credit card to reserve. Thank you for returning to our hotel! I am glad that your reservation and check-in went smoothly! We hope to see you again! "Excellent Stay and Excellent Staff"
I stay at this hotel whenever I am in Three Hills for business. Staff are excellent and helpful. Feel at home away from home. The breakfast is hot and ready in the morning. Fitness centre is excellent. "A surprising great hotel in a small rural community"
Meets BW standards or better. Enjoyed our stay. Close to a very nice restaurant within walking distance. Free pass to a great aquatic centre included in our stay that has a water slide, climbing wall. Lots of fun for the whole family. This is a great place to stay. The staff is very friendly and helpful. I could not believe how comfortable the beds were. It is very clean and the breakfast was excellent. Even though they don't have a pool you can get passes for the town' s pool which is close by. All in all it is a great hotel. Thank you so much for such a positive review! We are so happy that your stay with us was pleasant. We hope to see you again soon! After having issues with another local hotel this hotel took a large group in very late at night and were nothing but kind. 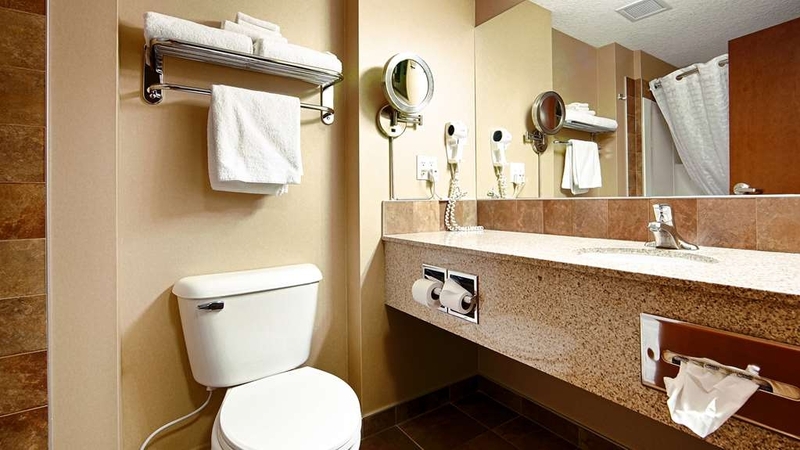 IT is very comfortable, clean, with reasonably priced rooms. Thank You Best Western!!! Nice heated outdoor hot tub as well as a free continental breakfast. Staff staye dlate past their shifts to make sure we all had a place to stay!! Excellent place to stay! Fantastic staff that go out of their way to accommodate teams. breakfast bar was kept up even with 3 teams descending on it at once. Group booking for reservations was great. Thanks BW for everything ! The staff were not pleasant. They made my family uncomfortable to be there. My daughter was followed around eating her breakfast. We stayed there because it was pet friendly and we are loyal to Best Western but the lady at the front desk was NOT pleasant to us since we had children and dogs along. I will never stay there again!! "Friendly Service!! The Cleanest Hotel Ever!! Awesome"
I stopped in at the Best Western Diamond Inn without a reservation this past July, and throughly enjoyed my stay. The hotel has very friendly staff and is so clean. The breakfast room was lovely and I wouldn't hesitate to go back. Also, the rate was reasonable. THANK YOU so much for taking the time to write us such a positive review! We look forward to your next visit with us. We needed at hotel late at night so booked a few hours before we arrived. The staff was waiting for us, took interest in what we had done. They were quick and efficient in getting us our room. Very clean, friendly hotel that does the little extras. Thank you for taking the time to write us such a kind review. We hope to see back to visit us again in the future. This is about the fourth or fifth time we have stayed at this hotel. Every time we have been very pleased so we plan this hotel into our travels whenever it works. Staff are very friendly and helpful and you see the same faces time after time; this is nice to see they stay around. Thank you so much for your kind review. We look forward to your next visit with us! This room had everything one could possibly need: fridge, micro wave, iron, ironing board, hair dryer, etc. It was clean and very comfortable. I wish I could have stayed longer. The exercise room had great equipment. The breakfast had great variety and was plenteous, besides being delicious. Thank you so much for taking the time to write such a kind review. We wish you could have stayed longer as well - next time! Upon entering this hotel appeared new but is 10 years old. Very well maintained. Deborah was very helpful in making sure we were in a quiet location as I had requested and we were given a mini suite on the 3rd floor over the lobby, very quiet indeed. 2 tv's so my husband could watch the football game and I didn't have to. It pays to be a Rewards member. The breakfast room was very nice but I did not care for the ready made eggs and I missed the boiled eggs and yogurt that most B/W offer. We enjoyed a good meal at the restaurant next door with a 10% discount from the hotel. Clean, quiet and comfortable is what I expect from a B/W and this hotel delivered. Stay here. Thank you for taking the time to write such a kind review - it truly is appreciated! Our stay was what we have come to expect from Best Western. Clean, quiet rooms and helpful and pleasant staff. Very happy to see the quality continues even in a small town. Will certainly be back. The pillows were a bit firm and lumpy for my taste, but not a big issue. The restaurant next door was very tasty and handy and the discount was great. Wish we could have stayed longer. So happy to hear your stay with us was wonderful! We can hardly wait to see you again sometime in the future. From appearance, to the welcome from friendly staff, to cleanliness, to room comfort, to breakfast... this hotel was the best we have stayed at in a long time. Real value for money, even if we didn't have time to use the hot tub. What an awesome review - thank you so much for taking the time ....! We hope to see you again! Three Hills is a quiet place, with an a very nice hotel, we really enjoyed staying here on our way back from a road trip exploring Alberta, the staff were very helpful with suggestions of places we could check out. Thank you so much for taking the time to write a such a positive review. We hope to see you again soon! My sister and i stayed on this hotel when we were visiting our ailing mom who was in the hospital. Upon explaining our situation to the front desk receptionist not knowing how long we would be there, she very quickly accommodated us with a 3 night reservation and offered us the hospital discount. The room was very clean and comfortable. The bathroom was sparkling clean as well. The continental breakfast was by far one of the best I've seen. We unfortunately only got to spend 1 night there as our mother passed away. The staff were very sympathetic and comforting. Would highly recommend this hotel. I'm so happy we were able to be of assistance to you in your time of need. The hotel was clean and quiet. Front desk staff was very friendly and helpful. Looks like a higher end hotel for the economy price. Free WiFi. There is a free breakfast in the morning. Didn't get to try the outdoor hot tub or gym, but it looked nice. Thank you so much for taking the time to write us such a kind review! We hope to see you again soon! I had a single room complete with 2 Queen beds. I stayed by myself. The service was excellant, the rooms were spotless, the best part I found was my room had a door leading outside to the parking lot and my car was outside of my room. I was driving my restored corvette and having it right outside my room was very comforting. There was some bad weather at the time and I was worried about hail, the gentleman behind the desk said if that happens bring my car under the overhang at the front entrance. That really appealed to me. All the staff were very courteous and helpful. The breakfast was very good. There is a steak house right outside the hotel where we ate and I was very impressed with the gualitu of food and the service. You do not leave there hungry. I will stay there again as my stay was very enjoyable. The beds were very comfortable, the bathroom was spotless. They do not have automatic check out, you have to go to the front desk to check out. I like the auto check out option with the bill under the door. Thank you so much for taking the time to write us such a kind review! We can hardly wait for your next stay with us! "Best hotel in our road trip for the value!" Our family did a 2 week road trip that included 5 different hotel stays. This one is by far the best of the lot for the value. Great "Best Western" style hot breakfast, very clean place, very helpful staff. We were going to Drumheller but couldn't find something there at the time of our booking so found this about 45 min drive away, but is worth the drive. The restaurant next door is reasonably priced with great menu. Thank you for taking the time to write us such a kind and positive review - it is very motivational to our staff, and truly appreciated! This hotel is keep very clean. Staff are helpful and friendly. Rates are reasonable. If you are going to Drumheller area and don't want to pay high tourist prices and don't mind a little drive to save a lot this is the place to stay. Thank you so much for your kind review! We hope to see you again in the near future. Our stay here in Three Hills was awesome! The staff was very friendly and helpful. They even went out of their way to share with us the God -given attractions the neighboring towns have to offer.They made us feel more than welcome in our overnight stay. We would definitely come back here! Thank you for being a part of our lasting memory.?????? Thank you so much for taking the time to write us such a kind review. We can can hardly wait to see you again for your next visit! Lovely little motel, in the heart of a tidy little prairie town, surrounded by beautiful countryside for a refreshing country drive. Convenient dining restaurant and lounge across the parking lot. All amenities available in the small town. thank you so much for your kind review! We truly appreciate you taking the time, and hope to see you again in the future! Very friendly and helpful personal. Just a short walk to down town. Includes breakfast. Our only issue was we were there during the long weekend Monday in August and there were no places open to eat, bar a pizza place and a grill. We are so happy to hear you enjoyed our quaint town. Please come and visit us again soon! We stayed here for one night on our way to Drumheller. The room was very specious, modern and clean. The beds were very comfortable, and breakfast had nice varieties. Front desk people were super friendly and very helpful. This hotel is 10 year old, but looks brand new! Price was very reasonable. We'll stay here for sure if we'll be in the area. Really enjoyed staying here and what a great price. We got the deal paying 100 per night for 2 queen beds. Super friendly hostess at the front desk, gluten free options for breakfast, quiet and comfortable rooms. Couldn't have been better! THANK YOU for such a kind review. We truly do appreciate all our guests, and hope to have you visit us again soon. This is a perfect home away from home if you are in the area. 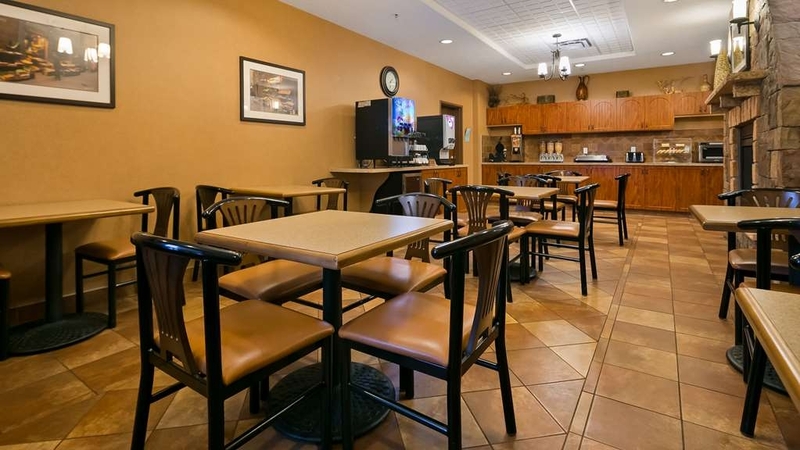 Perfect for Drumheller tourists if you need a place to stay that is within manageable driving distance out of town. Lobby is clean, bright, and inviting. Staff are friendly and attentive. Bed was very comfortable- one of the best sleeps I have had in a while! Breakfast area was a bit crowded, so make sure you get there early! Not a whole lot of tables and chairs. Thank you so much for your kind review. Our goal is to be "home away from home" to our guests - so I am happy to hear we are succeeding. Taking the time to write a review for our staff is very motivational and encouraging. We look forward to your next visit with us. I would stay here over and over. The staff were amazing, even housekeeping checking in with us when she passed us in the hallway to make sure everything was good. The breakfast area was a little small and it was hard to make two little kids wait for a table, but that is the only negative thing I have to say about this place. Aweeee thank you for such a kind review! You are more than welcome to stay here over and over. We can hardly wait to see you again. "Wonderful place to stay - Amazing Staff"
This is great hotel in a small town - easy to find - just off the main road coming into town. You will first notice the grounds - kept up to perfection with loads of great parking. One of my favourite features of the hotel is the ground floor rooms with their own private entrances....so nice. Check-in is smooth and fast - with a code for free wifi. Get to your room and you will find it CLEAN with very comfortable beds. Housekeeping is also great as you get to pick the features you want - and when you want it completed. 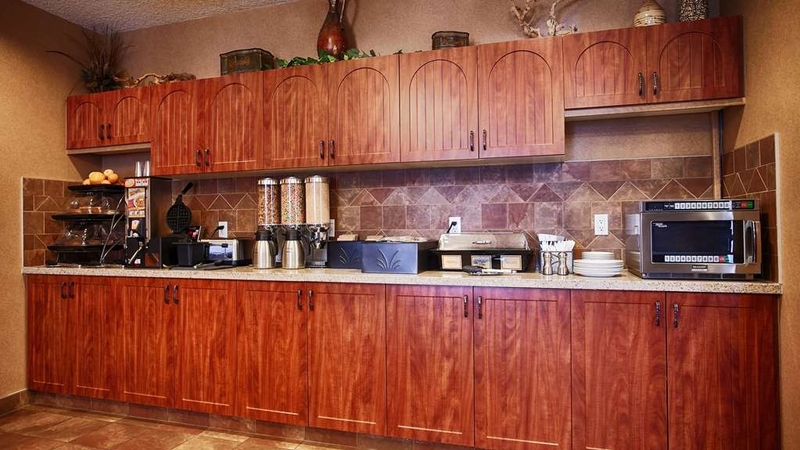 There is a great breakfast provided in the morning along with snack and pop machines. If you are into hot tubs and working out - also for you! Gas stations and places to eat are all around - within walking distance. Finding a better place under better management - would be a challenge! They are winning titles and awards - stop in and see the plaques they have on display. Thank you to Karla, Keryn, Amanda, Aaron, Jarred, Deborah and Housekeeping Staff for making this last stay another great stay! Thank you for taking the time to write such a kind review. We hope you will come back and visit us again soon! "Nice hotel. Small Dining area." The hotel staff were friendly and helpful. There is laundry service here and you get detergent including dryer sheets for free. $2 for the washer and $2 for the dryer. The rooms were clean and we had free wi-fi with excellent connection. There is a pub restaurant call 720 right next door to the hotel which we hear had great food but we did not get a chance to try. Perhaps next time. Overall a pleasant stay. This hotel had great clean rooms and wonderful staff, and we would stay there again without a doubt when we travel through next time. Stayed on the third floor facing west, with nice views over the prairie. Thank you so much for the kind review - it truly is appreciated and motivational for our staff! We stayed at this hotel for the July long weekend. The hotel was very clean and if you take the ferry it's not too far from Drumheller. They did however seem to be understaffed. Every morning they had the front reception making breakfast until about 8:00 when the person who makes the breakfast arrived. The one guy was taking out bread with his hands - no gloves - this made me cringe a bit. Also when it got busy in there they kept running out of the warm food. There was also an ant problem in the kitchen around the juice machine. Otherwise the staff were friendly and the room was cleaned well. Wish the hot tub was a bit hotter but not a bad hotel for a small town. Glad you enjoyed your stay - love the ferry ride! We stayed for two nights July 1 and 2, 2016 to explore rural Alberta also knowing it is only 45 minutes from Drumheller. This place is very clean and the staff are friendly and helpful. 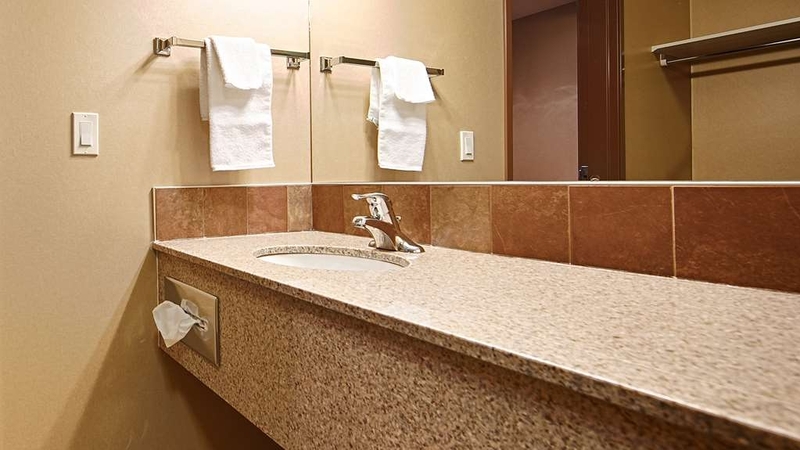 Rooms are contemporary with free Wifi and HD television. During our stay, a hot breakfast was included which included more than your basic continental breakfast. We would definitely recommend this hotel and would gladly stay again. I will share your kind review with our staff as if is very motivational - thank you so much, and we hope to see you again soon! My husband, son, mother and I stayed here for one night while travelling through. We got a great last minute deal on a suite, so we actually travelled a longer route just to stay here. The room was large with two queen beds and a sofa bed, so it worked well for us. There were two TV's - one in front of one of the beds and one in front of the sofa bed, so my husband and son didn't have to fight over them! The room was very clean and modern with comfy beds, a mini fridge, a microwave, and free wi-fi. A nice continental breakfast with hot items was included. The only thing missing for us was a swimming pool. I would definitely stay here again, as long as I could get a good price. I'm so happy we were able to accommodate you and your family! Glad to hear your stay with us was good, and we can hardly wait to see you again. "Great hotel with hot breakfast!" Friendly staff, comfortable beds, and good hot breakfast made this hotel a great choice for us! It is nice being able to trust the Best Western chain. I really think the staff at this hotel were down to earth and friendly. Thank you so much for taking the time to write such a kind review. I will share with the staff as it is very motivational for the staff, and reiterates that their hard work does not go unnoticed. We hope to see you again soon. We stayed here because we wanted to go see Drumheller and thought we may save some money by staying some distance away. For the twenty or thirty dollars that we did save we would just stay in Drumheller next time. Hotel was clean. Room was good size. Staff were helpful. Breakfast room was WAY TOO SMALL to accommodate a sold out Saturday night/Sunday Morning. Overall great property but too far from the action for us. Thank you for taking the time to write a review, and I'm happy you chose to stay with us. I hope we have the opportunity to have you visit us again sometime. "BEST EXPERIENCE - BAR NONE!!!" Fantastic facility and staff!!! Full breakfast!!! Reliable and fast internet. We always stay at Diamond Inn when in Three Hills. We stay at a lot of motels/hotels during our retirement travels, Diamond Inn is the best! Thank you so much for taking the time to write such a kind review! It means so much to the staff and is so motivational. Not to mention we love having you stay with us! "Great location to visit with Family"
We stayed at the Diamond in for a week in December to attend a wedding for a family member. The lobby of the hotel is beautiful with a huge stone fireplace and cosy chairs, being visitors from Australia it was warm and welcoming in a Canadian winter. Our room was huge and quite even though the hotel always seemed busy. The beds were comfortable and the rooms were kept spotless. There seems to be a large turn over of work men moving through the hotel at different times. We had use of washing and drying facilities which was great. The breakfast was well catered and included both hot and cold selections different variations on hot meats/bacon,sausage, ham, eggs, waffle-maker. I stayed here while I was in the area for business and the choices are somewhat limited due to the locale. That being said, very nice, cordial staff during check-in & out. I did not eat the breakfast while I was there but seemed to be a decent array of choices considering the regular continental spread. The one thing that stands out for me was the overall quietness of the hotel. Apparently there was a big dance going on in town but I did not hear a thing. Biggest downfall was the air conditioner in the room. It would not operate on the maximum setting or was just plain defective. I did stay in a different room the second night I stayed there and the results were similar. Other than that I enjoyed my stay there. Thank you so much for taking the time to write us a review Richard. I'm happy your stay with us was a positive one, other than the air conditioner issue. Will be looking at both of those in the rooms today. I am grateful that you let us know. We hope to see you again in the near future. Just like any other BW chain hotel, the BW Diamond Inn in Three Hills is excellent!!! Clean, comfortable, great breakfast, the BEST beds, friendly staff. It was very nice- the only thing that was iffy is the internet service in the rooms. However, the hotel was full of teenage basketball players who were probably ALL on the internet so that could have had something to do with it! THANK YOU Trudy for your kind review!!! So pleased you enjoyed your stay with us, and taking the time to acknowledge all of our staffs hard work. It is very motivational to them. Please come and stay with us again soon. Great spot - professional, friendly, helpful staff. Clean, decent breakfast - wonderful hospitality. From the moment I drove into the parking lot, I was impressed with the facility. Highly recommend this hotel if you are in the area. Thank you so much for your kind review! It means a lot to our staff for your kind words, and is very motivational to know that all their hard work does not go unnoticed. We hope to have you come and visit us again. The staff are friendly and amenities are very good. 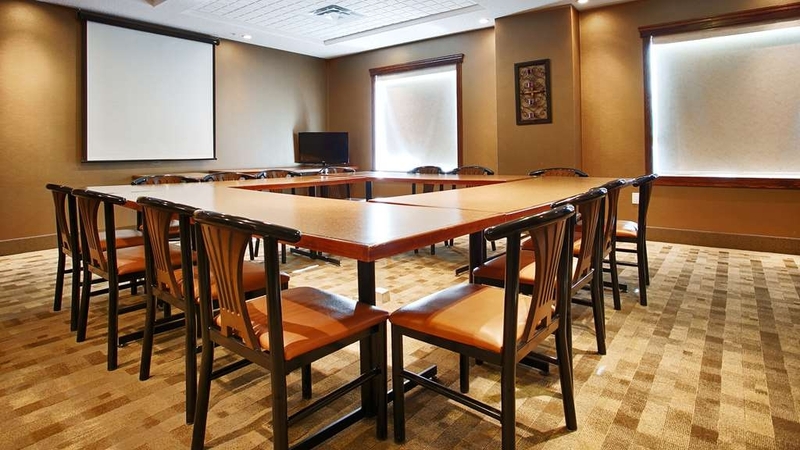 Excellent deal for business or pleasure and exceeds expectations for a small town, has all the amenities of a city hotel. It's quiet and peaceful and feels safe. It is greatly appreciated that you have taken the time to write such a positive review. So happy to hear you had a peaceful and enjoyable stay with us. We look forward to welcoming you back! "Very accomodating for hockey teams!" We stayed here this past weekend with our 7 and 8 year old hockey team. The staff at this hotel are the most accomodating I have probably ever stayed at with a team of loud, playful kids! Very friendly, very accomodating, hands down awesome!! Thank you for the awesome review!!!! We are so happy you enjoyed your stay with us, and everyone had a great time - our staff included!!! Hopefully we will see you again next year. THANK YOU! For taking the time to write such a kind and positive review, it is truly appreciated! We look forward to your next visit with us. Modern, clean and friendly. Beautiful room in a hotel that seemed brand new. Staff were available, helpful and efficient. The half block from the main street meant no noise and very little traffic. Thank you for an excellent experience! We will be back. Thanks you so very much for such a positive review, We truly appreciate you taking the time out of your busy schedule. I will share your kinds words with our staff, as it is very motivational, and shows that their hard work does not go unnoticed. We are looking forward to seeing you again soon! We had no problems with noise from other guests and slept well. The breakfast was good considering it's "free", although a bit limited in selections. The door lock on our room was a little difficult and would usually require 2 or 3 key swipes before it opened. The staff assured us they would check into it. We were only there for 2 nights so it wasn't a big concern to us. We would definitely stay there again if were in the area. Thank you so much for your kind review! We hope to see you again in the future. Came for a mini vacation for my birthday, Just wanted to get out of town for a couple nights. Picked this hotel for it's smoking rooms. Decent price, room was standard. The restaurant next door really made the trip - So i would highly recommend it Otherwise, wouldn't make a specific trip out of it again, But if we were ever in Three Hills again, Best Western would be my choice. Thank you so much for taking the time to write such a positive review. We look forward to seeing you again. We stayed at the Best Western while we were in Three Hills visiting relatives. We were here for six nights. 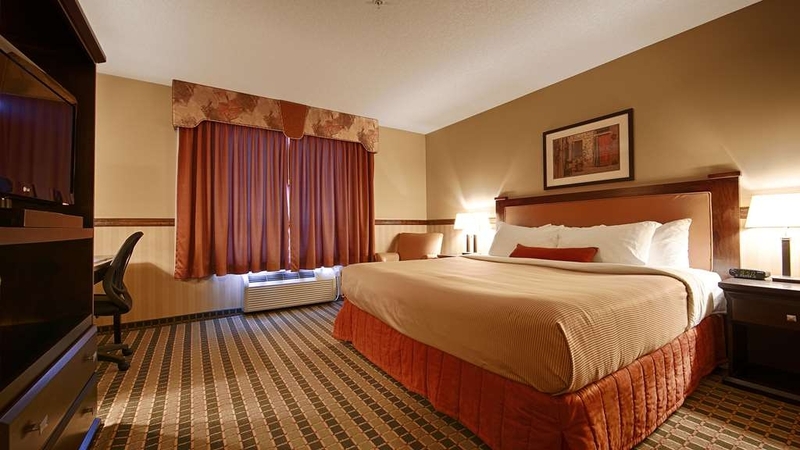 The room was clean and comfortable, and the staff were friendly and helpful. They went above the normal to make our stay pleasant. Their breakfast was more than what we normally eat with a nice selection of items. The location of the motel was very convenient for us, and the room was a good value for the cost. We would stay here again. Thank you so much for your kind review. I will pass on your positive words to our staff, as they are very motivational and encouraging. We definitely hope you will come and visit us again. "Overnight stay while on cross-Canada (return) road trip, going to Tyrell Museum in Drumheller.."
Very nice, clean, modern and well appointed modern rooms for a small town in the middle of nowhere.Most affordable hotel anywhere near our destination. Front desk staff/mgr extremely friendly, personable, very helpful and accommodating. Went above and beyond to assist us and to make our visit comfortable and a great experience. Even recommended a great restaurant in close proximity, providing a discount for hotel guest. Allowed us use of the hotel spa and hot tub, with extra towels, even tough closing time was near .... superb and relaxing after a long trip. Thank you so much for taking the time to write us such a positive review. Your kind words are truly appreciated, and motivational for our staff. Please come back and visit us again in the near future! This is a very nice hotel. The beds are great. It is very quiet and the staff are really friendly and down to earth. Rooms are nice and well appointed. The town has several restaurants. Try the Harvest House in the center of town. thank you so much for your kind review! It is truly appreciated and motivational for our staff. We do our best to make us "Your Home Away From Home" for our guests, glad to hear you enjoyed your stay. Please come back and visit us again soon! My wife an I stayed here in August 2015. It was a last minute choice so all that was available was a smoking room. We reluctantly took it but there was no need to worry. I was clean and did not smell of smoke at all. A month later we stayed with a group and booked 25 rooms. We had to let them know ahead of time (two weeks) how many rooms but this wasn't an issue when it came down to it. Check-in was very efficient and we were all able to make our supper next door. Everyone had only good things to same about the Best Western Diamond Inn. Definitely recommend it for 1 - 25 room bookings. Thank you so much for your kind review. It means a lot to our entire team that you take the time to complete the on line survey. We truly appreciate it, and hope to see you again soon! On a unexpected work stop over, I found myself in Three Hills Alberta. After doing a short run around the town to check the Hotels and Inns available, I chose to go to the Best Western because of a previous experience in B.C.. I was not disappointed. Rooms are new, Bathrooms are spacious and clean. Bed is new, with plenty of pillows. Hotel looks like it cant be more than 5 years old. I will be staying here again when in the area. Had a nice breakfast as well, with a waffle bar. Thank you so much for taking the time to write us such a positive review! It is truly appreciated and motivational for our entire staff. Please come and stay with us again soon. Three Hills is a small town in rural Alberta so you may think this small town would have less for good accommodation hotels, that would be an incorrect assumption. This town has a super good Best Western. As good as any big city, if not better. To add to the pluses, right next door is an excellent eatery so you can go as good as you want. Thank you so much for taking the time to write such a positive review. It is truly appreciated, and very motivational for our entire staff! Please come back and visit us again soon! Comfort. Convenient & Cost Effective We 'Google Mapped' our way across Alberta from SE to NW and were delighted to find this gem! One of the cleanest and well appointed hotels in a smaller community that we have stayed in. Thank you so much for taking the time to write us such a kind review!! It truly is appreciated, and motivational for our staff. Please come back and see us again soon. "good hotel for a stopover"
Clean nice rooms. Staff nice. Breakfast suprisingly good. Overall a good experience. I have nothing bad to say about this hotel. As it was mostly empty maybe they should bring their prices down a bit? Thank you so much for taking the time to write such a kind review. We have been extremely busy with work crews, and they leave early in the am and come back late at night. This is possibly why you suspected we were not busy when you stayed here. Please come back and visit us again soon.